"Something is wrong with this team right now. There, I said it, and if you're a fan who watches the games with an objective eye then you know that I'm right. Ever since they went on that tear in July and early August the Red Sox have been slumping and playing incredibly uneven baseball." That was how I formulated the introduction to this recap in my head as I watched the first few innings of the game, but as they've done so many times this season the Red Sox completely flipped the script as the it went on and I had to revise what I was going to write. As you'll see, it was a tale of early innings, late innings, and the contrasting extremes between them. That's not to say, though, that the White Sox were pushovers. For a team in third place (at game time) in what's probably the worst division in all of baseball, they've got a lot of talent. Along with Oakland they're the only team with a winning record against Boston this season and when they jumped all over Rick Porcello in the early innings, it looked like it was going to be another disappointing game for the Sox. Avisail Garcia hit a two run homer in the first and Chicago got another run that inning when Matt Davidson singled in Daniel Palka to stake the other Sox to a quick 3-0 lead. Porcello surrendered another run in the second when Garcia's sacrifice fly pushed Yolmer Sanchez across. It was 4-0 White Sox and the Red Sox just looked lifeless. Then, as on the night before, the seventh inning happened. Blake Swihart got things started with an RBI single to drive in Brock Holt which was followed by Jackie Bradley's sac fly to cut the deficit in half. Mookie Betts hit his 29th home run of the season, of the two run variety, to tie the game and stun Chicago. Then, with the score knotted at four in the ninth inning, Boston exploded to put the game away for good. Bradley (who has been absolutely red hot since the All Star break) singled to drive in Ian Kinsler and was followed by Andrew Benintendi who did the same to drive in Swihart. JD Martinez finished things off when he hit a three run homer (number 39 for him) to put the game out of reach. Chicago went quietly in the bottom of the ninth and the Red Sox got a thrilling 9-4 win. Combined with the Yankees loss against the Tigers (in New York! ), Boston's lead in the division grew to 8.5 games. Even though Boston was outhit 10-9, they made every single one of those hits hurt. Kinsler had himself a night, going 3-4 with two runs scored while Mookie and Bradley each drove in two runs and JD drove in three. As for Porcello, he didn't do much to quell the concerns over his recent outings. He only went five innings (facing one batter in the sixth) and gave up the four early runs on eight hits. While he did strike out seven, he also walked three and just didn't look sharp. He's one of those guys where if he's missing his locations just a little bit, he gets hit hard. That was the case in this one until he settled down. The bullpen managed to keep the White Sox off the board and only surrendered two hits over the final four innings (although was anyone else as worried as I was to see Heath Hembree out there in the ninth? No lead, even five runs, is safe from him). Riding a three game winning streak, Boston will look to Nathan Eovaldi to get back on track in the second game of the series Friday night. He'll be up against former Red Sox prospect Michael Kopech (who went over to Chicago in the Chris Sale trade). It'll be a good chance for Sox fans to see Kopech and assess whether or not we got the better end of the Sale deal (although final judgment can't be made until we see what the kid becomes in a few years). In the meantime, the rest of the series should be interesting and hard fought before the stretch run kicks into gear next week. With 2018 being the fiftieth anniversary of the formation of Led Zeppelin back in 1968, there promises to be a slew of books and commemorations given their esteemed place in rock music history. 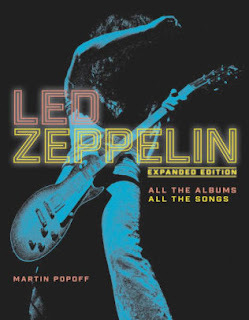 On this site I've reviewed several books on the band as well as biographies of singer Robert Plant and guitarist Jimmy Page, but the new book Led Zeppelin: All the Albums, All the Songs is the first book dedicated solely to their music that I've worked on. Released in late August, the book is the expanded and final edition of author Martin Popoff's work detailing every Led Zeppelin song. In a similar vein to a well known Beatles book A Hard Day's Write (which I will review at a later date), Popoff takes a chronological look at every song the band recorded and released. This expanded edition includes previously unreleased bonus tracks from the 2014 Led Zeppelin remaster campaign as well as one-off tracks from their BBC sessions. In his introduction, Martin Popoff starts off right away proclaiming his distaste for the Beatles and mentioning that he's written the most record reviews in the world. This got the book off to a bad start for me and no, it had nothing to do with his comment about the Beatles (I couldn't care less whether others like them or not). More than anything it was his writing style and tone which put me off from the get-go. In addition to the tone, a recurring annoyance with the writing that permeated the entire book from beginning to end was his awkward and stilted (and oftentimes downright incorrect) syntax. Another minor but recurring annoyance were the photo captions on each page. Most were correct (although a few were not), but all of them were simply lifted verbatim from the text of each entry. A small thing, I know, but one that along with the author's writing style really grated on me throughout the duration of the book. Just my personal opinion, but I figured I'd share it anyway. As for the content of the book itself, it's a mostly pleasant trawl through the Led Zeppelin catalog, starting with "Good Times Bad Times" on the self-titled debut album and ending with "Wearing and Tearing" on Coda. There's a bonus chapter added to this edition of the book that adds sixteen "essential" bonus cuts that the author deems unique and/or important enough to be included. These are mainly fully realized one-off tracks like "Traveling Riverside Blues," "The Girl I Love, She Got Long Black Wavy Hair," "Swan Song," and the like. A few of them are outtakes that were included on the remastered albums from a few years ago, but overall I have no quibbles with the ones Popoff chose. The individual entries themselves are all one page with a handful of them stretching over two pages (usually for longer/important songs like "Stairway to Heaven" and "Kashmir," for example). Each song is given a synopsis of the inspiration behind it, some mention of where and when it was recorded, and fleshed out with the author's thoughts on its merits (or lack thereof). Any recording curiosities or anomalies are also noted (in a similar vein to another book I've reviewed, The Beatles Through Headphones). For the most part, there wasn't anything too revelatory in terms of new information that was brought to light, but there were some nice passages which helped put certain songs in context relative to the band's career and contemporary state of mind. Overall, the book was a fairly enjoyable journey through Zeppelin's music although there were some things I disagreed with the author about. One was his assertion that Stephen Davis' Hammer of the Gods as a quality Led Zeppelin biography (it's decent enough but has serious problems). Also, there were numerous times I disagreed with his reviews of the songs themselves. For instance, he gushes on and on about "Celebration Day" being the greatest song the band ever recorded; I think it's a damn good song, but I can think of ten others off the top of my head that I would put above it in the pantheon of their best music. However, that's the nice thing about books like this: the author's opinion doesn't always have to jibe with your own and can often lead to lively debate either with yourself or others. Overall, while the update of this book does feel a little bit like a way to cash-in on the band's upcoming fiftieth anniversary this October, it's also fun enough that if you haven't read it before it's worth checking out. One thing I deeply wish the publishers had invested in was a better editor because in addition to the horrendous sentence structure and grammatical usage, there were a LOT of typos and they got more numerous as the book went on. Perhaps the editor got tired the longer the book went on? In any event, this is a book Led Zeppelin fans should check out. You may or may not learn much of anything new but you'll enjoy it and it will inspire you to listen to their albums as you go through each entry. That was the best thing it did for me. I don't know about anyone else, but I still wasn't feeling too good about the Red Sox win against Miami in the first game of this series. They seemed to win more because of the Marlins' numerous mistakes than anything else. Still, a win is a win and style points aren't awarded...they all count the same in the standings. It seemed as though the Sox were set up better to win the series finale with David Price on the mound, but given how things have been going for this team lately nothing could ever be as straightforward as it appears. Price has been red hot lately and he's been the Red Sox best pitcher by far over the last month. However, he got off to a shaky start when he gave up a solo homer to Derek Dietrich in the second inning. Eduardo Nunez, who has been swinging a very good bat over the last couple of weeks, answered with a solo shot of his own (his second in as many games) in the bottom of the inning to tie it up. Price coughed up more runs in the third when he gave up two: first, an RBI double to JT Realmuto and then an RBI single to Starlin Castro. It was also in this inning where Price took a line drive off the wrist and had to leave the game. It just seemed as though the Sox couldn't catch a break, even after Mookie Betts homered to make it 3-2 Miami. The Marlins picked up another run in the fifth when Castro drove in another run with a single and you could feel the angst building at Fenway Park (and in my living room). How could the best team in baseball be struggling for the second night in a row to a borderline major league roster? JD Martinez' single in the sixth drove in Mookie but it was still 4-3 Marlins and when Miami picked up another run in the seventh on a Realmuto fielder's choice, it seemed like it just wasn't Boston's night. Then the bottom of the seventh happened. The Red Sox went on to score a season-high eleven runs in that inning, starting with Blake Swihart's RBI single to bring in Nunez (who led off the inning). Jackie Bradley doubled to drive in Ian Kinsler and tie the game and from there the flood gates opened. Mookie's double drove in Swihart and Bradley and then Brock Holt hit a stand-up triple to push Mookie across. Xander Bogaerts singled to drive in Holt and then Nunez singled to drive in JD, but they weren't done yet. Kinsler's single, Swihart's double, and Bradley's single drove in four more runs total and when the dust settled the Red Sox were all of a sudden up 14-5. It was enough of a cushion that even yet another home run given up by the Red Sox bullpen (Ryan Brasier this time) didn't hurt as the Sox earned the series sweep with a 14-6 win. It was harder than it needed to be, but the team responded when push came to shove and with the Yankees losing their game (and series!) to the White Sox, the division lead was expanded to 7.5 games. Except for Andrew Benintendi, Steve Pearce, and Sandy Leon every Red Sox hitter had a hit and of those, they all had multi-hit games except for JD and Xander. Mookie also reclaimed the batting average lead by pushing his average up to .340 while JD's slipped to .337. As for the pitching, it wasn't too pretty but it was enough to get the job done although going forward it's a growing concern given the caliber of teams Boston will be facing in September. For now, though, let's enjoy a series sweep and a bit more breathing room in the division. The Sox head to Chicago for four games against the White Sox (who just took two of three from the Yankees in New York). While they're in last place in the AL Central, they've got a lot of talent and are a better team than the Marlins so the Red Sox may have their hands full. The Pale Hose also took two of three from Boston at Fenway earlier in the season (along with Oakland they're one of only two teams who currently have a winning record against Boston this season). Rick Porcello will start the opening game Thursday night and needs to rebound from his poor outings over the last couple of weeks. This series begins the stretch run into September so every game counts from here on out...it should be a fun ride to the end! Hot on the heels of getting swept in Tampa, it would seem on its surface that a home series against the AAAA Marlins should be just what the Red Sox need to snap out of their funk. Combined with their excellent home record, the two game series seemed like it would be the perfect way to pick up a couple of easy wins before heading to Chicago to take on an equally dismal team in the White Sox. Of course, there's a reason why games are played on the field and not in the minds of fans and if anyone still feels good about this Red Sox team after the first game against Miami, then they weren't paying attention. It seemed like the Sox were on their way when Ian Kinsler drove in Xander Bogaerts with an RBI single in the second, but Isaac Galloway homered off of Brian Johnson in the third to tie the game at a run apiece. The Sox put two more up in the bottom of the inning when Andrew Benintendi's double drove in a run followed by a sacrifice fly from Bogaerts. Eduardo Nunez added another in the sixth with a solo home run and at 4-1, Boston headed into the eighth inning looking like it would be an easy win against a bad team. Of course, it's never easy with the atrocious bullpen the Sox have, especially their middle relief. When JT Realmuto hit a two run bomb off of Matt Barnes, I was worried but felt okay since Boston still had the lead. But when Barnes gave up a solo shot to Starlin Castro to tie the game my concern turned in to anger. Heath Hembree came on in relief of Barnes and (I'm sure you know where this is going) proceeded to give up two more runs on a Rafael Ortega single. Just like that, the three run lead was wiped out and the Sox found themselves down by two heading into the bottom of the eighth. As I sat there in stunned disbelief, I felt the suppressed anger I've had toward the bullpen all season finally boil over. The middle relief has been this team's Achilles heel for the better part of three seasons yet here we are still trotting out the same bums like Barnes, Hembree, and Joe Kelly (who was actually alright in this one) game after game. It seemed unbelievable that the Sox were going to lose such a winnable game against a bad team because of these guys. Thankfully, as they've done all season, the bats bailed the bullpen out. Jackie Bradley came to the plate with the bases loaded and two outs and proceeded to knock a single into center field to drive in two and tie the game. Mookie Betts was up next and walked but ball four was a wild pitch from Tayron Guerrero (who could barely throw strikes all inning) that sailed to the backstop and allowed Kinsler to score the go-ahead run. Heading into the ninth, the Sox were up a run and had Craig Kimbrel in to close...game over, right? Well, not necessarily given A) how bad Kimbrel has been the last month and a half, and B) how little he's pitched over the last two weeks since the team hasn't needed him. After giving up two walks, he allowed an RBI single to Magnerius Sierra (who was hitting a robust .168 going into that at bat) to allow Miami to tie the game. At that point, I threw my hands up in disgust and for the first time all season was really angry at this team. The Yankees had come back from four runs down to win their game against the White Sox and the Red Sox were in danger of allowing them to shave another game off the division lead with this disgusting performance. Lucky for Boston, they were still playing the bumbling Marlins. In the bottom of the ninth, Eduardo Nunez grounded into what should've been an inning-ending double play, but JT Riddle threw the ball over the head of the first basemen which allowed JD Martinez to score the winning run and give the Sox a harder-than-it-needed-to-be 8-7 victory. If you're a Red Sox fan (and if you're reading this, then you most likely are) you should not feel good about this win. At all. In fact, you should probably feel a little worse about this team than you did before the game (I know I do). Yes, they won, they ended their three game losing streak, and they kept the division lead at 6.5 games, but there is some serious cause for concern now and it rests almost solely with the bullpen. It's been a mantra of mine and others that the middle relief is terrible but if they can just get to Kimbrel, they're fine. This season, though, Kimbrel has been shaky and has shown none of the dominance that he has in years past. Even worse, since the All Star break he's been downright lousy, giving up more walks, hits, and blowing more saves than he ever has. I realize that relative to most other teams we're still in great shape at closer, but given the high bar he's set for himself we should all be worried. If this team can't hold a lead against a borderline major league lineup with nothing to play for in late August, how will they deal with a Yankees, Indians, Astros, or Athletics team in the October crucible? I've got no issues with Johnson, who continues to do what the Sox need every time he starts: keep it close and eat up some innings. In his 4.1 innings of work he struck out three, walked one, and only gave up one run on five hits. Brandon Workman and Kelly held down the fort after Johnson, but Barnes, Hembree, and Kimbrel blew it all away and were only saved by the offense. Miami outhit Boston 13-12 but the Sox were able to gut this one out. JD, Bogaerts, Nunez, Kinsler, and Bradley all had two hits in the game while Mookie and Benintendi chipped in with one each. It was an ugly win that raised more concerns than it allayed, but in the standings all that matters is the win and not how it was earned. The hand wringing is for us fans to deal with while the players just play. The Sox now look to the red hot David Price to shut down the Marlins as they go for the sweep Wednesday before moving on to Chicago for the next series. Hopefully Price can go deep in the game as he's been doing lately, not because the bullpen needs rest but more so that Alex Cora won't have to use them! Those of us Red Sox fans who are old enough to remember what it was like pre-2004 aren't surprised by this swoon the team is going through right now. For the younger generation, all they know is the Red Sox as perennial winners who always in contention and willing to spend whatever it takes to get there. Those of us who are older (say, 35 and above) know that this is a new development and that it was never like this before the current ownership group bought the team in the early 2000s. All of this is to set up the point that even though that the Red Sox are currently in a little bit of a slump, it shouldn't be entirely surprising or unexpected regardless of how great a season they're having. It's a long season and it's happened many times before. That being said, I think I join the rest of Red Sox Nation in being disappointed and a little concerned at their play over the last couple of weeks. I was mostly okay with the split against Cleveland because the Indians are a very good team. I didn't necessarily expect the Sox to sweep Tampa (although I would've loved for that to have happened) because the Rays are talented and playing great ball right now. I did think the Sox would win the series and after last night I at least thought they'd avoid the sweep. Wrong and wrong. What happened today was one of the poorest showings this Red Sox team has had all season. The fact that it's taken until late August for them to have a spell like this is a testament to how great they've been all season, but it only takes the sting out of it a little bit. Boston starter Nathan Eovaldi was coming off a string of bad starts after a great beginning to his Red Sox career and was up against Rays All-Star Blake Snell. Additionally, both JD Martinez and Andrew Benintendi had scheduled rest days, so Alex Cora's lineup was a lot weaker both in the field and at the plate. This was borne out early when the Rays plated two in the bottom of the first: Ji-Man Choi hit an RBI single and was followed shortly by Jake Bauers' sacrifice fly. Tampa continued to pour it on, first with Tommy Pham's RBI single in the third and and then Kevin Kiermaier's two-RBI triple (his second triple in as many games). Matt Duffy hit a sac fly in the fourth to make it 6-0 and by then it was getting ugly for Boston. The Sox finally got on the board in the sixth when Mookie Betts' sac fly drove Sandy Leon in, but for the second game in a row a single run was all the Sox would get. Duffy doubled in a run in the bottom of the sixth and Michael Perez drove two more in with a double the next inning to make it 9-1 Rays. That's how the game would end and with it, the sweep was complete. The Sox were outhit 12-3 and looked atrocious at the plate: only Betts, Eduardo Nunez, and Jackie Bradley had hits. Eovaldi was just as bad, giving up six runs on eight hits in four innings (although he did strike out five batters without walking any). The bane of my existence this season, Heath Hembree, coughed up the two runs in the sixth while Matt Barnes was the culprit in the seventh in giving up the final Tampa run. File this game (and this series) under one to forget. The Red Sox have a day off Monday which should be used for a mental health day as much as it should be used to rest any physical ailments. There follow two consecutive series against cellar dwelling teams (Miami and the Chicago White Sox) which should hopefully help the Sox get back on track as they head into September, because the final month of the season is going to be a veritable gauntlet of playoff teams. The Braves, Astros, Indians, and Yankees (twice) all remain on the schedule with only a few cupcakes thrown in (the Mets, Blue Jays, and Orioles). If the Red Sox are going to hold on to the division and finish with the best record in the majors, they'll need to fatten up on the bad teams so that they can go toe-to-toe with the other American League heavyweights. The angst and tension will no doubt get ratcheted up with each win or loss, but I'll be damned if it won't be fun to watch all the way through to the end of the season. Well, Red Sox fans, this is how we know we've been spoiled over the course of this incredible season: it's late August when the team is having its first real bout of adversity and there's a lot of hand wringing across Red Sox Nation. The Sox looked terrible when they dropped the series opener to Tampa on Friday, but surely they'd rebound and storm back in the second game, right? Especially with Rick Porcello on the mound, it seemed that they were ready to right the ship and get back on the winning track. However, Tampa has been hot lately and unfortunately they continued their great play on Saturday night. Unlike the first game, the Sox got on the board early in this one. They were threatening in the second inning with runners at the corners and no outs and seemed poised to blow the game open, but Mitch Moreland hit into a double play to kill the rally. JD Martinez was able to score from third, but that lone run would be all Boston would score all night. Porcello was not sharp in this game, but he was grinding out innings and seemingly leading a charmed life by repeatedly getting out of trouble unscathed (including one inning where he loaded the bases with no outs). In the bottom of the fourth, Brandon Lowe drove in a run to tie the game, but that was all Tampa got that inning. After gutting his way through five innings, it was more than a little surprising when Alex Cora sent Porcello out to start the sixth inning and I'm sure he regrets that decision now. Porcello put runners on the corners by giving up a leadoff triple (to the badly slumping Kevin Kiermaier) and hitting a batter before leaving the game. That proved to be too much for Ryan Brasier to inherit and overcome. Brasier allowed a run via a wild pitch and then gave up a sacrifice fly to Joey Wendle. The game was still in reach at 3-1 heading into the seventh, but Brandon Workman surrendered a solo home run to Tommy Pham to make it 4-1 and Tyler Thornburg (who has never looked truly good in a Red Sox uniform) gave up another when Ji-Man Choi's triple drove in the final Tampa run. The fact that Choi had looked awful and went 0-3 to that point only added insult to injury. With every appearance, Thornburg reminds Red Sox fans that the team got absolutely swindled on the trade that brought him here in exchange for Travis Shaw. A late Red Sox threat was obliterated when Andrew Benintendi got picked off of first base...it was just that kind of game. The Sox went down to a 5-1 loss and with the Yankees sweeping their doubleheader with Baltimore (huh, I guess they can beat bad teams once in a while) the division lead was shaved down to seven games. There was a lot about this game that was ugly and in fact, the Sox are playing some bad baseball lately. They've now lost five of their last seven games and apart for those two wins against Cleveland, they've really been struggling to score runs recently. They've been shut down by some real no-name pitchers and haven't been able to take advantage of poor outings by good pitchers (see: Corey Kluber in the first Cleveland game). Mookie Betts has been slumping badly, going hitless again and letting his average dip below JD Martinez (who now leads the American League in RBI and average and is one home run off the lead) and he hasn't hit a home run since early in the month. The only Sox players who had hits in this game were JD and Eduardo Nunez (each with two) and Xander Bogaerts (with one). Overall, the team has been looking a bit worn down and like they're pressing at the plate. Porcello is also a bit of a concern, having not looked particularly sharp since his gem against the Yankees in early August. He's won some games since then but they've all been a shaky and his last few starts have not been good at all. Things won't get any easier when the Sox have to go up against Blake Snell in the series finale Sunday afternoon. This series was the first one the team has lost since late June and there's a real danger they'll get swept if they don't get to Snell early and score enough runs to support Nathan Eovaldi (another guy who hasn't looked good over the last few weeks). The Red Sox are still in great shape and it's better to get this slump out of the way now instead of dealing with it in October, but it's not exactly how you want to see them heading into the final month of the season. They've got a couple of series against bad teams (Miami and the White Sox) coming up before it gets tougher again. Atlanta, Houston, the Yankees (twice), and Cleveland all loom large in the final weeks so they really need to take advantage of games against non-playoff teams. The Yankees seem to be shaking out of their funk and it would be bad timing if the Sox started to sink into one of their own right now. ...but as I've said all season, baseball is a weird game. I'm sure we all expected the Red Sox to get destroyed by the Rays after they just split with the Indians, right? That's exactly what happened as this one was close until all of a sudden it wasn't. When Tampa jumped out to a 3-0 lead in the second inning off of a Carlos Gomez fielder's choice and Michael Perez' two-RBI double, it didn't seem like a big deal. The Sox have come back from deficits like that all season and Xander Bogaerts' two-RBI single in the third seemed to bear this out. However, Velazquez completely lost he plot in the third inning when he allowed five runs. Kevin Kiermaier, Gomez, Brandon Lowe, and Perez, all singled in runs to push the Rays up 8-2. Then in the fourth with Drew Pomeranz in for a long relief appearance, the Rays got a a two run blast from Willy Adames to put the game out of reach for good at 10-3. It's sad that this is what it's come to for Pomeranz, who now only finds himself pitching in mop-up duty in blowouts. In this game though he was far better than Velazquez, holding down the fort for 4.1 innings and only giving up two runs on one hit. The Sox picked up a run in the fifth when JD Martinez drove in Andrew Benintendi with a single and they threatened a few times later in the game, but Beeks kept them off kilter all night and they couldn't convert. A chance with the bases loaded in the eighth was particularly frustrating when they came away empty-handed and they shockingly lost in a 10-3 blowout. Velazquez was putrid, only lasting 2.2 innings and giving up eight runs on nine hits. Yes, Alex Cora waited too long to give him the hook but it happened so suddenly that it probably wouldn't have mattered one way or another...it was just one of those nights. Boston actually outhit Tampa 13-12 but none of them were clutch and in a strange twist, every Red Sox hit was a single. For the second time facing them since being traded, Beeks confounded the Red Sox. Everyone had a hit except for Mookie Betts and Jackie Bradley and Mookie's recent slump has seen JD Martinez close to within 0.003 points for the batting average lead. One loss isn't a huge cause for concern even with the Yankees coming back in extra innings to barely beat the Orioles, but it's a bit surprising how flat the Sox came out after riding high at the end of the Cleveland series. Mookie's recent offensive lull is a bit concerning especially given how consistent he's been all season to this point, but it's better to get it out of the way now than to slump in October. Rick Porcello will take the mound for game two in an effort to right the ship and get the Red Sox back on track against this annoying Rays team that is very talented and tough despite their record. The series with Cleveland wrapped up with a midweek afternoon game pitting starters David Price and Adam Pultko. With the sudden awakening of their bats from their recent slumber, the Red Sox pounded out ten runs on Wednesday night and looked to carry over that momentum into the finale. With memories of the ALDS sweep at the hands of the Indians in 2016 and the potential to face them again this October, it would go a long way toward establishing some confidence (and quieting naysayers) if the Sox could salvage a split before the next time they meet. It was a scoreless pitcher's duel until the bottom of the fifth when the Red Sox finally broke through and got to Plutko. To that point there had only been three hits total in the game between the two teams, but Boston got the inning off to a good start when Sandy Leon led off with a double. Jackie Bradley followed with a single to give the Red Sox runners at the corners with no outs. After Mookie Betts popped up, Andrew Benintendi drew a walk to load the bases for Blake Swihart. Blake battled with Plutko before drilling a double to center field to drive in Leon and Bradley and give the Sox a 2-0 lead. JD Martinez reached to load the bases again which brought up the hottest hitter on the team, Xander Bogaerts. He chopped a double over Jose Ramirez at third base which drove in another two runs. Boston continued to bust it wide open when Eduardo Nunez' double drove in two more to make it 6-0. That chased Plutko from the game and the Sox picked up another in the sixth off of JD's RBI single. Red Sox pitching took care of the rest, with David Price throwing an absolute gem. In his eight innings of work he only gave up three hits and struck out seven without walking anyone. Tyler Thornburg worked the ninth and while things got interesting when he put the first two batters on with no outs, he induced a double play to shortstop and a pop fly to end the game and preserve the 7-0 shutout win. Offensively, the Sox outhit the Indians 12-5 and every starter except for Benintendi had at least one hit. Mookie Betts, Swihart, and Bradley all picked up two hits apiece and the relentless attack this order has when everyone is hitting was shown yet again. In particular, Bradley and Bogaerts have been crushing the ball lately which has been nice with Mookie in a little bit of a lull. With their 90th win of the season in the bag, a new road series begins Friday in Tampa as Hector Velazquez will make another spot start. Presumably it'll be his last one since Eduardo Rodriguez is due to come back next week after making a rehab start at AAA Pawtucket over the weekend. After that it's back home for a quick two game set against the Marlins before they're back on the road for another week and a half to begin September and the race to season's end. I'm really looking forward to the final series against the Astros, Indians, and Yankees before October. While I can't wait for the postseason, I'm not ready for this magical season to finish just yet. Like I said yesterday, baseball is a confusing game. You can be the best team in the league and on one day, you look unbeatable while on another it looks like you can't beat anyone. Granted, Cleveland is one of the better teams in the American League, but I don't think Red Sox Nation was expecting the Sox to drop the first two games of this series in the manner they did, especially at home. With the collective angst of Boston fans at probably it's highest (and yet most unwarranted) level of the season, all eyes were on the team to see how they'd respond to perhaps their biggest adversity of the season. The Red Sox couldn't take advantage of Corey Kluber's off night in game one of this series and got shut down by a rookie pitcher in game two. So what do they do in game three against one of the hottest pitchers in the American League? Why, rough him up and knock him out of the game in less than four innings, of course! We all saw that coming, right? It didn't look like that's where this was heading when the game got underway and Cleveland jumped out to an early lead in the first when Edwin Encarnacion knocked a two run homer to center field and gave the Indians a quick 2-0 lead. The Sox responded in the bottom of the inning when JD Martinez cut the lead in half with an RBI single. Xander Bogaerts, who has been swinging a very hot bat lately, hit home run number eighteen on the season in the fourth to tie the game and the Sox were off to the races. Blake Swihart knocked in a run with a single to left field and then, with the bases loaded Andrew Benintendi cleared them with a double. Just like that, it was 6-2 Boston and Carlos Carrasco's night was over. Encarnacion struck again when he crushed another two run homer in the fifth off of my old nemesis Heath Hembree, but Mitch Moreland provided some much needed breathing room when he hit a two run shot of his own in the bottom of the sixth. That gave Boston a bit of a cushion at 8-4, but they weren't done yet. Xander hit his nineteenth homer of the season in the seventh to make it 9-4 and JD pushed across the final Red Sox run of the night with another RBI single in the eighth. Boston got the 10-4 win, kept their chances for a series split alive, and alleviated a lot of hand wringing and stress across New England and beyond. With the Yankees losing 9-3 to the pathetic Marlins (hey Yankees fans, at least the Red Sox can beat bad teams) the division lead was pushed back up to nine games. Every Red Sox batter had at least one hit and collectively they outhit Cleveland 14-8. Moreland, JD, Xander, and Jackie Bradley all had two-hit nights and while they left sixteen runners stranded on base for the game, they responded when they needed to. Brian Johnson did his job in keeping the game close, going 4.1 innings and giving up three runs (he wasn't responsible for Encarnacion on the second home run...that was all on Hembree) and striking out three while walking one. It wasn't Chris Sale level stuff, but he did what he was asked to do so that the team had a chance to win. The series finale is Thursday afternoon and features the surging David Price going up against Adam Plutko. That's a huge mismatch on paper, but as the old saying goes: "games aren't played on paper." I'm looking for the Sox to carry over the momentum from this game to win and earn the split. If they do that, they should feel good about their showing against one of the major contenders in the AL as they head to Tampa to start a new road series Friday. Baseball can sure be frustrating sometimes. In the first game of this series the Red Sox jumped all over Cleveland ace Corey Kluber, but couldn't hold the lead and blew the game. In this second game, they were up against rookie Shane Bieber and looked to bounce back and even the series. Nathan Eovaldi was on the mound for Boston and all eyes were on him to recapture the form of his first two Red Sox starts and not the most recent two. As I said in the opening sentence, though, this can be a frustrating game and that was perhaps never more evident this season than in this tilt. This was a scoreless game until the fourth when the Indians broke through against Eovaldi. Yan Gomes singled in a run which was followed by a Greg Allen double to drive in another. At that point it was 2-0 Cleveland and it seemed only a matter of time before Boston would break through and answer, but Bieber kept them off balance all night and only allowed two hits through the first six innings. Melky Cabrera (again?) hit a solo shot in the sixth to make it 3-0 Cleveland and that was it for Eovaldi's night. Joe Kelly came on in relief and surrendered a run on a Michael Brantley single that also ended the inning. Brantley's hit was corralled by Jackie Bradley who threw home to try and get Gomes out at the plate. Gomes scored but Sandy Leon threw it down to second where Xander Bogaerts was able to tag Brantley out trying to stretch his hit into a double. That ended the inning but made it 4-0 and the Indians added to their lead in the seventh off of Yonder Alonso's sacrifice fly. Finally, in the seventh the Sox broke through against Bieber by putting the first two men on. Andrew Benintendi doubled followed by JD Martinez' single. With runners on the corners, Xander hit a double to drive Benintendi in and move JD to third. It looked like the Sox were poised for a big inning especially when Mitch Moreland launched a ball to center field, but Allen made a great catch that turned a surefire 2 RBI double into a sac fly. Bogaerts scored on Ian Kinsler's fielder's choice and the Sox ended the inning with three runs, but it just felt like Cleveland got away with less damage than they should've. Gomes hit a solo homer in the eighth to make it 6-3 and Boston went quietly in the final two innings (although it got a little interesting in the ninth when Jason Kipnis botched the easy third out by letting a routine pop fly hit the ground next to him). Like I said earlier, frustrating. Eovaldi wasn't very good, surrendering ten hits and four runs while only striking out two and walking one. However, what was absolutely inexcusable was allowing a rookie pitcher to completely stymie them. Cleveland outhit the Sox 13-5 and until the seventh inning, Boston only had two hits. Their five total in the game came off the bats of four players: Benintendi had two while JD, Xander, and Eduardo Nunez each had one. I can see getting shut down by a guy like Kluber, but Bieber? It's the first time the Sox have lost three games in a row all season and in those three losses, there's been a sudden drop in scoring. It's especially troubling since Cleveland is a good team and a lock to make the postseason given the horrifically bad division they're in. It won't get any easier in the third game of this series when Brian Johnson will get the start against Carlos Carrasco. The Sox need to get a split in this series...anything less, especially at home, would be an unacceptable disaster (not to mention fuel for obnoxious Yankees fans who laughably insist "the Red Sox can't beat good teams"). This current skid may be the biggest adversity they've faced all season so it will be very interesting to see how Alex Cora rallies the team and guides them through it into the final month of the season. It blows my mind that it's mid-August and the Red Sox are only now playing the Indians for the first time this season: Cleveland is the only team in the American League that the Red Sox have yet to play. They've got this four game set at Fenway Park and then three games in Cleveland at the end of September and while the Indians aren't as dominant as they were in 2016 or even 2017, they're still a damn good team. Yes, they play in the worst division in baseball and have the worst record of the four AL contenders (Boston, New York, Houston, Cleveland) and also have fewer wins than Oakland, but they're still a dangerous team. There's also been the knock on the Red Sox (said mainly by Yankees fans) that "the Red Sox get all of their wins against bad teams." Never mind that A) they've split with Houston so far, B) they're winning the season series against the Yankees 8-5, and C) the Yankees keep losing to "bad teams" like the Orioles, Rays, and Royals. Still, I've been looking forward to this Indians series because it comes in the midst of a tough stretch of the schedule for the Sox and because it should be a good measuring stick against another legitimate American League contender. You couldn't have asked for a better pitching match up in the series opener than 2016 Cy Young Award winner Rick Porcello against 2017 winner Corey Kluber. It promised to be a low scoring affair dominated by pitching, but in reality it was a tale of two games. For the first half, Porcello shut down Cleveland while the Sox jumped all over Kluber. Xander Bogaerts' single in the first drove in two runs (Mitch Moreland and JD Martinez) to put the Sox up early. Andrew Benintendi roped a single to left field in the second to push Jackie Bradley across and it was 3-0 Red Sox after two innings. The way Porcello was pitching, it looked like it would be enough, but the proverbial wheels fell off the cart in the fifth when he hung too many pitches over the plate. Melky Cabrera (he's still playing?) hit a solo homer to keep the Indians from being shut out and in the sixth Michael Brantley launched a two run shot to tie the game. (This one was especially frustrating because had Porcello covered first base earlier in the inning on a great Mitch Moreland grab, it would have left no one on base). For some reason, Alex Cora sent Porcello back out for the seventh and it cost them dearly when he gave up another two run blast, this one to Greg Allen. Just like that, Cleveland scored five unanswered runs and took the lead. Boston got one back in the ninth when Xander Bogaerts' dribbler to third base resulted in an infield hit RBI, but it was too little, too late as Ian Kinsler flew out with two on to end the game. It was a game that the Sox absolutely should have won, but it instead resulted in a 5-4 defeat. They caught Kluber on a night where he wasn't at his best, they got to him early, and they still couldn't capitalize on it. Boston outhit Cleveland 13-7 but left eighteen runners stranded on base...far too many against a good team like the Indians. Mookie Betts, JD, Xander, and Bradley all had two hits a apiece and the team was hitting the ball hard, but they couldn't convert. As for Porcello, a night where he looked so dominant at the beginning turned into a real disappointment as an old bugaboo of his, giving up the home run, came back to bite him. His final line of six hits, five runs, six strikeouts, and one walk over seven innings doesn't convey how bipolar his performance was in this game. It certainly wasn't what I was expecting. Since there's no crying in baseball, there's nothing to do but brush this one off and move on to the next one (shockingly, it's the first time all season that the Sox have lost two straight games at home). Nathan Eovaldi will get the ball for the Red Sox in game two and he needs to pitch better than he has over his last two starts. A win to start off this series would have been great and put the Indians on their heels; instead the Sox need to make sure they can at least get a split. Winning the second game would be a great way to erase the stink of blowing this opener..let's see how they respond to a little adversity. On Sunday afternoon the Sox wrapped up their series against the Rays with a matinee tilt. Hector Velazquez was starting for the newly injured Chris Sale and with the team having already won the series by taking the first two games, there wasn't any pressure. A big series against the Cleveland Indians follows this one so while getting the sweep of the Rays was the goal, it wasn't crucial. Still, Velazquez has been solid this season so a sweep was entirely in the realm of possibility as long as the bats did what they've been doing thus far in the series. Unfortunately, there wasn't much action at the plate in this game and what little action there was came from the Tampa bats. The Rays outhit the Sox 4-2, but it was only two of their hits that hurt Boston. Joey Wendle hit a solo homer off of Velazquez of the second inning and CJ Cron hit one off of Matt Barnes in the ninth. That was all the offense in this game as the Sox went down with a whimper to the final score of 2-0. Velazquez wasn't terrible...he only gave up a single run in his four innings of work although he did walk three and only strike out two. Three of the four Tampa hits came off of him while the other (Cron's home run) came off of Barnes. The trio of Brandon Workman, Joe Kelly, and Heath Hembree held the Rays hitless but got no run support. It was former Red Sox pitcher Jalen Beeks (who was sent over in the Nathan Eovaldi trade in late July) who pitched the longest for the Rays and although he wasn't spectacular (four innings, one hit, two walks, and three strikeouts) it was enough to shut down the Sox on such an anemic day at the plate. The only two Red Sox hits came off the bats of Andrew Benintendi and Xander Bogaerts...otherwise, it was a game to forget all around. In a weird scheduling quirk, the Red Sox will face the Indians for the very first time this season 126 games into it. While Cleveland plays in the worst division in all of baseball and aren't as dominant as they were in 2016 and 2017, they're in first place and are still a very talented and well managed team. Alex Cora will face off against old friend Terry Francona in a match of two great managers and with Cy Young winners Rick Porcello and Corey Kluber facing off in the series opener, it should be a great four games pitting two of the top teams in the American League against each other. Earlier in the season, the Rays had played the Red Sox very tough and shown that they were not an easy team to face despite their record. As the season has gone on, however, the Red Sox have beaten up on them more and more to the point that it basically feels like an automatic win every time they play them. (I realize a large reason for this is the number of good players Tampa has traded in the last year). In this second game of the series Boston had David Price going up against the team he made his major league debut with. Given how well he's been pitching lately, it looked like it should be another win the Sox should easily cruise to. Unlike the previous night where the Rays jumped to the early lead before the Sox stormed back, in this game Boston flipped the script. Mitch Moreland continued to swing a good bat when he doubled and drove in Andrew Benintendi in the bottom of the first. Ian Kinsler then walked with the bases loaded to bring in another run before Brock Holt reached on a fielding error which allowed both JD Martinez and Xander Bogaerts to score. At he end of one inning it was 4-0 Red Sox and they never looked back. JD added to his major league home run lead by belting his 38th of the season in the third to make it 5-0. The Rays picked up their only runs in the sixth inning when CJ Cron hit a two-run home run to help Tampa avoid the shutout. Price was excellent, though, and those were the only runs he allowed in his seven innings of work. For the game he gave up five hits and struck out eight while only walking two. Ryan Brasier worked a clean eighth and Craig Kimbrel earned his 37th save of the season to lock down the win. The Sox were actually outhit in this game 5-4, but their hits did more damage and they were able to take advantage of that Tampa Bay error. With the unexpected news that Chris Sale would again be going on the 10-day DL with mild shoulder inflammation, his start in the series finale Sunday afternoon will be taken by Hector Velazquez. I'm not too worried about what it means for this series or even necessarily the final month of the season, but I'm starting to get a little concerned as to what it might mean for October. The Red Sox are a very deep and talented team, but they need Chris Sale to be healthy and at his best if they're going to make any noise on the way to the World Series. Hopefully it's just another precautionary measure but it'll bear close scrutiny as the season starts to wind down. Even though the Red Sox had Thursday off, we still got to see Mookie Betts up close and personal. That’s because my son and oldest daughter attended his baseball clinic and got to meet Mookie, take a photo with him, and work on baseball drills with him. They had a blast and I think I had as much fun watching them for the entire afternoon as they did playing. Mookie seemed like a genuinely nice guy and the fact that he had his parents there hanging out with him the whole day said a lot to me about what type of person he is. At least I know how he spent his day off, right? On Friday, the Sox got back down to business at home when they started a new series against Tampa Bay. The Rays had just taken two of three from the Yankees and helped us add a half game to the division lead so now it was Boston’s turn against this pesky team. Brian Johnson got the start for the Sox and looked to continue his solid pitching as of late, but by the end of the first inning it seemed like it might have been an off night. The Rays jumped on the scoreboard early when Joey Wendle’s two RBI double and Carlos Gomez’ single quickly made it 3-0 Rays. As this Red Sox team has done all season, though, they came storming back. In the bottom of the first they plated two runs when Xander Bogaerts tripled to drive in Andrew Benintendi and JD Martinez. The Sox would tie it in the fourth off of Eduardo Nunez’ RBI single and from there, they never looked back. Mitch Moreland put the Sox ahead in the fifth with an RBI single to drive in Mookie and they continued to add to their lead as the game progressed. Jackie Bradley (who had a GREAT game at the plate and in the field) doubled to drive in Blake Swihart in the sixth and in the seventh, JD drove in a run and then scored later in that inning on a wild pitch. Tyler Thornburg finished off the game and the Sox won 7-3. Johnson pitched very well after the first inning, settling down and finishing with a line of five hits, three runs, two walks, and two strikeouts in 5.2 innings of work. That’s not the pitching line of a Chris Sale or Rick Porcello, but he did enough to keep the Rays off balance and get the win. On the offensive side, everyone had at least one hit except for Swihart and Ian Kinsler (who returned from the DL the same day Rafael Devers was put on the shelf with a hamstring injury). Bradley and Moreland had nice 2-4 nights while Xander went 3-4 with a triple, two doubles, two RBI, and a run scored. So far he isn’t exhibiting his usual late season slowdown at all, which is very nice to see even though he’s gotten banged up a bit recently (he was hit on the hand by a pitch last week and in this game he fouled a ball off his shin). And after making yet another highlight reel catch in center field, surely this has to be the year Bradley finally wins a Gold Glove, right? The series continues this weekend with David Price facing his former team in the second game on Saturday. He’s been pitching very well as of late and I’ll be looking for that to continue against Tampa. With a 10.5 game lead and a little more than a month to go, the Sox sit at 87-36 and look destined to not only finish with the best record in the majors but also to break the 100 win plateau. Honestly, that second bit doesn’t concern me as much because come the postseason it won't matter one bit. As long as they win the division and can secure home field advantage throughout October, I’ll be happy. I really feel like this year they’ll have a much better showing in the postseason than they did in 2016 and 2017. A small part of me wants to fast forward to October right now, but more than that I’m really looking forward to enjoying the rest of the regular season and seeing how this team amazes us next. The Phillies are good this year, but are they really good enough to play the Red Sox to a draw? Yes, they're in first place in the NL East, but the NL is down across the board this year when compared to the AL and overall the best teams in the AL are much better than the best teams in the NL. Still, to this point the two teams have scored five runs apiece against each other and the Red Sox have won two of the three games. The final game between the two squads looked to be another close affair but I was hopeful that Boston could eke out a win and sweep this two game set. His previous start notwithstanding, Nathan Eovaldi has been solid for the Red Sox at the back of the rotation since he was acquired in July. For the first few innings of this game he looked to be continuing his strong play when the Sox jumped out to a three run lead while knocking out Phillies starter Vince Velazquez in the third inning. After walking the bases loaded by giving a free pass to Eovaldi, plunking Andrew Benintendi in the back, and surrendering an infield hit to Brock Holt, Mitch Moreland ripped a single to center field that made it to the fence and emptied the bases. The Sox loaded the bases again in the inning but weren't able to come away with more runs and in the end, it cost them. Eovaldi looked alright but not particularly sharp and the Phillies finally got to him in the fourth inning. Wilson Ramos (who had a damaging night against the Sox) hit a double that plated Rhys Hoskins and got Philadelphia on the scoreboard. Obduel Herrera grounded out to Moreland but that allowed Nick Williams to score from third, while weak hitting Carlos Santana (who entered the game hitting .214 on the season) hit a pinch hit RBI single that tied the game. Eovaldi's final line was three runs on seven hits, five strikeouts and no walks in five innings. Not stellar, but certainly serviceable and on most nights, good enough to potentially get your team a win. The Phillies would never trail again though and a huge reason why was, you guessed it, the Red Sox bullpen. Joe Kelly surrendered the go-ahead run in the sixth when he allowed a sacrifice fly to Scott Kingery to put Philly up by a run. Even worse was Drew Pomeranz in the bottom of the seventh. Ramos doubled off of him on a ball that was surprisingly badly misplayed by Jackie Bradley to score two runs. Mikael Franco followed it up by roping a single to bring in Ramos and push the Phillies' lead to 7-3. It was quintessential Pomeranz, who even in relief labored to get through a single inning needing thirty-two pitches to get out of a frame where he game up four hits and three runs. It looked like the Sox were going to get back in this game when Mookie Betts (who had gotten the night off) came in to pinch hit with the bases loaded and no outs in the eighth. He was able to drive in a run on an infield hit to cut the lead to three runs, but the Sox couldn't capitalize on anything after that and went down quietly to the 7-4 loss. With the Yankees losing to the Rays there wasn't any damage done to the Red Sox division lead, but it was really frustrating to see the Sox continue to struggle against a good (but not great) team that they should've beaten. You can't win them all and tonight was a prime example of a game where the bounces just happened to go Philly's way and not Boston's. Every Sox starting position player had a hit in this game and Brock Holt had two (2-3 on the night), but the Sox couldn't capitalize when it mattered and left twenty-three men stranded on base. That's not going to win you many games no matter who you play. For now, these two teams are done playing each other and the Sox get another day off Thursday before opening a home series against Tampa Bay on Friday. That game will have Brian Johnson taking the mound for the Sox and hopefully will see a return to timely hitting and increased scoring, two things that were curiously lacking in all four games against the Phillies this season. I guess Philly is just one of the rare teams who (like Oakland) have Boston's number in 2018. Both the Red Sox and I had rest days yesterday. For them, it was a much needed break in the middle of a long season; for me, it was the first official day of my vacation and my first day back in my native New Hampshire in over a year. Being back in the heart of Red Sox Nation meant I was surrounded by like minded Sox fanatics so after the day off, I couldn't wait for the team to get back in action with this short two game series against the Phillies. While I hate interleague play (I think I've mentioned that once or twice, no?) I was curious to see how the Sox would fare. The last two games against Philadelphia that were played in Boston back in July ended in a series split with two low scoring games. I wanted to see if those were just flukes or if there was more to Philly than I had previously thought. With Rick Porcello on the mound the Red Sox had as good a chance as ever to win this game. It was scoreless until the third when Sandy Leon hit his fifth homer of the season to put Boston up 1-0. It looked like Porcello was going to cruise through the game and for the most part he did, only surrendering a solo shot to Rhys Hoskins in the fifth. It seemed a shame that he may not get the decision in this one, so he must be thanking Brock Holt because his pinch hit homer in the eighth put the Sox up 2-1 which was enough for Craig Kimbrel. He picked up save thirty-six on the season and preserved the win for Porcello, who earned his 15th. Rick went seven strong innings only giving up two hits, the single run, and struck out ten without walking any. It was as dominant an outing as Chris Sale had two days ago and helped the Sox to yet another win against a good team. They outhit Philly 6-2 in another low scoring affair: in three games against the Phillies this season, Boston and Philadelphia have each scored five runs. They're either evenly matched or (more likely) Philly is just a tough match up for Boston. One last thing: buried in those six Boston hits was a 1-2 day at the plate for Porcello, who looks to be a decent hitting pitcher (remember his bases-clearing double in Washington in early July?). What can't this guy do? The Yankees loss on Monday dropped them to ten games behind Boston in the AL East and that's how the standings remained with both teams winning Tuesday. The Sox will go for the sweep of Philly on Wednesday when Nathan Eovaldi takes the ball and looks to atone for his horrific start in Baltimore last week. That will set the team up for another off day Thursday (two in a week...strange, huh?) before starting a series at home against the tough Tampa Bay Rays. With only six weeks left in the regular season and some challenging series coming up over the next month, the best part of the major league baseball season has just begun. The Red Sox are 86-35 and are chasing history while giving us one of those seasons to remember. Make sure to savor every moment because seasons like this don't come around very often, if ever. Having taken the first three games of this series over the last two days, the Red Sox were in prime position to sweep the Orioles. Chris Sale was making his return to the rotation after being on the DL the last two weeks with mild shoulder inflammation and all eyes were on him and how he would pitch. There had been some concern over whether this was his usual wearing down toward the end of the regular season and what this would mean for his effectiveness in the postseason. What better way to ease back into the swing of things than an afternoon start against the woeful Orioles? The caliber of opponent aside, it turned out that the rest may have been exactly what Sale needed. The finale was a low scoring affair that was dominated (at least for the first five innings) by Chris Sale; he was absolutely filthy in his limited work. I understand that Alex Cora wanted to limit him in this one to ease him back in, but Sale made the most of his short stint in the game. In his five innings he only gave up one hit and struck out twelve batters without walking any...and he did it all with only sixty-eight pitches. That was more than good enough to lower his ERA to 1.97 and earn his twelfth win of the season. Offensively the Sox had a relatively quiet day, outhitting Baltimore 9-5 while being more effective with the hits they got. Steve Pearce, who's been pretty quiet since the Yankees series, led off the scoring in the first inning with a solo homer. JD Martinez drove in yet another run to add to his league leading RBI total with a double in the fourth that brought in Brock Holt. It stayed 2-0 for a while until Trey Mancini got Baltimore on the scoreboard with a sacrifice fly in the eighth to bring in Cedric Mullins. As they've done all season, though, this Red Sox team responded by scoring in the next inning. Jackie Bradley singled to drive in Eduardo Nunez and then scored when Mookie Betts' double pushed him across. Craig Kimbrel picked up his 35th save of the season by striking out three to secure the 4-2 win and the sweep. Bradley and JD each went 2-4 at the plate while everyone else besides Sandy Leon and Mitch Moreland chipped in with a hit each. It wasn't the greatest display of offensive fire power, but it was enough. With the division lead remaining at 9.5 games, the Sox will get two days off this week which is a true rarity. After resting Monday, they'll begin a two game series against the Phillies in Philadelphia before getting Thursday off. From there, the schedule gets much more difficult with two series against Tampa Bay (one home, one away) and a series with the Cleveland Indians for the first time this season. After games against the Miami Marlins and Chicago White Sox, another rugged stretch unfolds as the bulk of September is taken up with series against tough teams like the Houston Astros, Yankees, and Indians. There are some series mixed in with cellar dwellers like the New York Mets, Orioles, and Blue Jays which will give them opportunities to pick up some easier wins in the midst of the stretch run. No matter what happens, this has been an incredible season so far and looks like it's going to be exciting all the way to the end. Well folks, it's JD Martinez' world...we're all just living in it. After taking the early game in this doubleheader, the Red Sox were trying to sweep the day and win the series by taking the first three games against the Orioles. With Hector Velazquez getting the start and recent call up Dan Butler starting at catcher to give Sandy Leon some much needed rest, it wouldn't have been at all surprising if the Sox dropped this game and split the twin bill. But as we've seen time and again with this team in 2018, there is no quit in them no obstacle seems too insurmountable for them to overcome. Leading the way was the best slugger in the league who put the Sox on his back and delivered when it mattered most. When the O's scored first in the second inning off of Renato Nunez' double, it seemed as though the Orioles just might win a game in this series. Trey Mancini added to the lead with an RBI single of his own in the third. JD was having none of that and added to his league leading home run total by hitting number 36 in the fourth to cut the Baltimore lead in half. Butler's sacrifice fly tied the game in the fifth and in the sixth the go-ahead run for Boston scored on a wild pitch ball four to Rafael Devers that allowed Steve Pearce to score. However, the usual suspect (Heath Hembree) allowed a home run to Joey Rickard which tied the game. For everything that Alex Cora has done right this season, which is almost everything, I will never understand why he continues to go with Heath Hembree game after game and especially in close situations. He has been utterly brutal this month and I would honestly rather see a struggling Joe Kelly, an inconsistent Matt Barnes, Ryan Brasier, Brandon Workman, ANYONE else out there besides Hembree. Lucky for him, JD saved him from being the goat when he crushed his 37th home run of the season, this one with Pearce on base to break the tie and give the Red Sox some breathing room. Brock Holt added an insurance run in the ninth when his hit drove in Mookie Betts (though Holt himself was erased at second trying to stretch it out). Mancini hit a solo shot in the bottom of the ninth off of Craig Kimbrel, but Craig picked up his 34th save of the season (and the 100th of his Red Sox career) by striking out three and slamming the door shut on the 6-4 Red Sox win. While Mookie had a good game (2-5 and pushing his average up to .351), JD was the hero in the nightcap. He was an on base machine, going 2-2 with two runs scored, three RBI, and two walks while bumping his own average up to .332. He added to his league leading totals in home runs and RBI and is currently second in average behind Mookie...a legitimate Triple Crown threat. This guy has been worth every penny the Sox paid him (and probably more) not only for his hitting prowess but his leadership in the clubhouse. He's one of those rare players (like Mookie or Mike Trout) where every at bat is a must see just so you don't potentially miss seeing something incredible. The doubleheader sweep increased the division lead over New York to 9.5 games and sets the Sox up nicely to sweep the O's with Chris Sale pitching in the finale. While I wouldn't be surprised at all to see some rust on Sale given his layoff, with as good and deep as this team is (and as bad as Baltimore is) I'm confident that another win is in the cards.